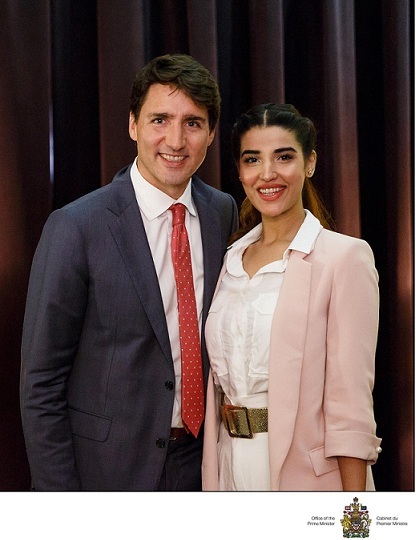 Multitalented Hareem Farooq, is once again set to rock Canada, after a recent meeting with the Canadian Prime Minister “Justin Trudeau”, as the gorgeous actress & producer will not only be taking the stage as the official host of the HUM Awards 2018 happening on 28th July, 2018, but will also be performing for the first time on an award show. Hareem Farooq, for the first time in her career, will be performing in an awards show; taking the super-hit number ‘Billo Hai’ from 2018’s first blockbuster Pakistani film, Parchi - which she acted in and produced. Farooq has earlier performed on the same number, with Ali Rehman Khan, at the opening ceremony of T10 League in Sharjah, UAE in Dec 2017. Not new to hosting game, this is the second consecutive year that Hareem Farooq will be hosting Hum Awards, as she was also a host for the event in 2017. While earlier this year, Farooq became the first female celebrity to host the opening ceremony of the Pakistan Super League in Dubai. Harem Farooq has been winning hearts with her enthralling acting skills especially in “Diyar-e-Dil” and in films including “Dobara Phir Se” and “Parchi”. Currently, she is the talk of the town due to her new drama serial “Main Khayal Hoon Kisi Aur Ka” that airs every Saturday at 8pm on HUM TV.